Enjoy Beverly’s newest event with wine-tasting and a variety of heritage music! This event is scheduled to last from 11 am until 8 pm. Admission to music and wine-tasting area will be $10 for adults, $5 under 21. The vendor area, with a variety of quality crafts and food vendors, is admission FREE. The first ever Rhythm and Wine Festival in Beverly will offer the public a chance to listen to six different live bands while enjoying wine-tasting from West Virginia wineries. On August 17th, the Beverly Heritage Center will host this one-day event, which will also feature a variety of craft and food vendors. The festival will be open from 11 a.m. until 8 p.m., with a $10 admission for ages 21 and over, and $5 for guests under 21. The craft and food vendor area will be free and open to the public. 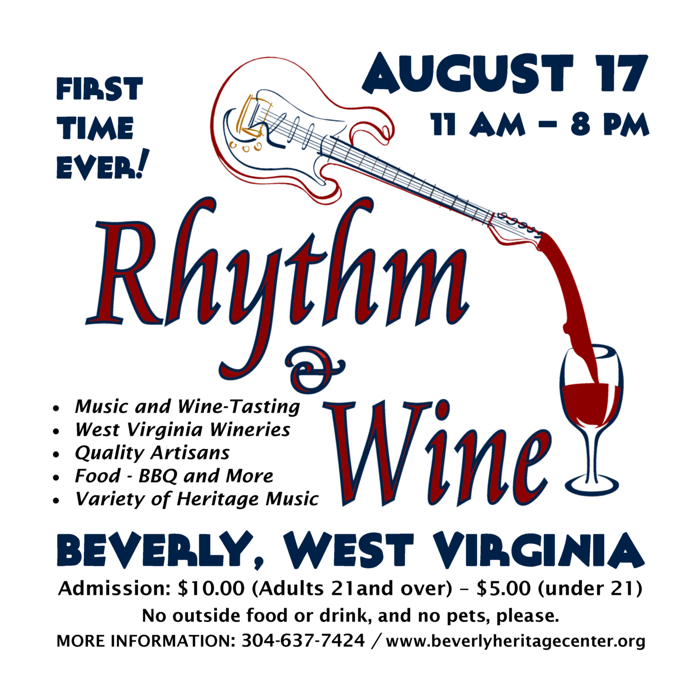 The musical line-up for Rhythm and Wine includes well-known acts such as the Dennis McClung Blues Band, Aurora Celtic, Jumpstart, Gerry Milnes and Friends, Caleb Karriker, and Falling Branch String Band. The music will begin at 12 p.m. with Falling Branch String Band, a group that plays traditional American music from the southern Appalachian tradition. They are primarily a vocal band, and specialize in harmony singing, but also play many traditional fiddle and banjo tunes. 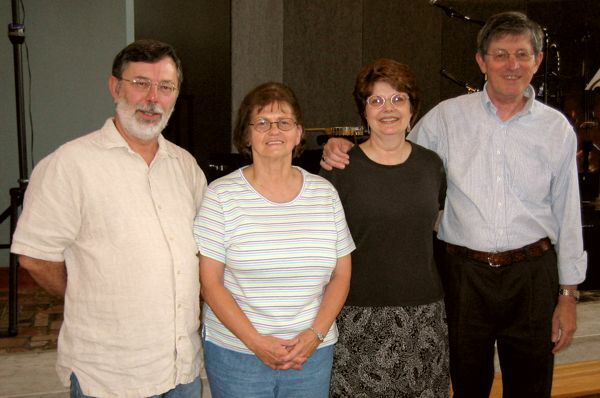 All of the band’s members live in Elkins and have been playing together for twenty-five years. 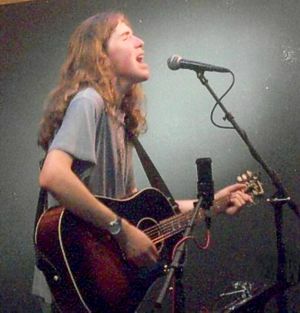 Caleb Karriker is a young songwriter, musician, and singer from West Virginia who splits his time between Elkins and Shepherdstown. He describes his music as “equally informed by rock sensibilities and American roots traditions.” In addition to his solo excursions, Karriker also plays bass in the Shepherdstown-based band Bad Moon and guitar in the Elkins-based band Holey Soles. He is slated to perform at 1:15 p.m.
Gerry Milnes and friends, a band that includes John Rossbach and Jesse Milnes, will present a program of traditional music from Randolph County and the surrounding area beginning at 2:30 p.m. Milnes has collected old-time music in the region since 1975, and sources include many old-time players from the Tygart Valley. 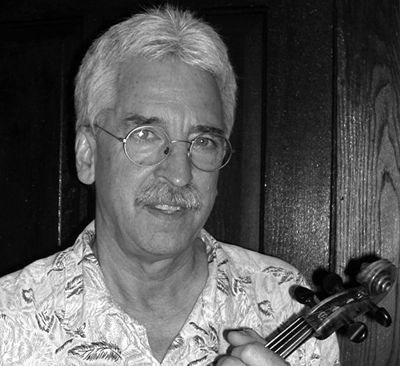 Banjo tunes, square dance tunes on fiddle, old-time songs, and unaccompanied ballads will make up a program of local and regional interest. 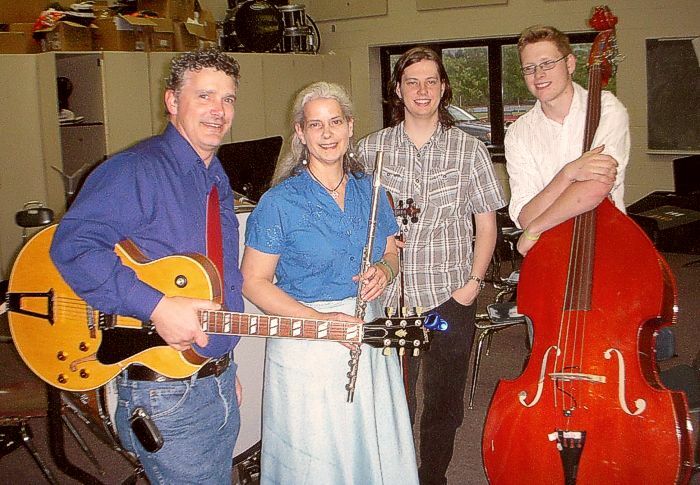 Jump Start is a band inspired by the music of early jazz and the big band swing era. The band also offers Jump Blues, which speeds up the blues for dancing. The flute played by Katy McClane of Elkins is featured as a lead horn, which creates a unique sound for this swing band. Jump Start will be performing at 3:45 p.m.
From the hills of West Virginia, Aurora Celtic plays evocative, original and traditional music for guitar, fiddle, Irish flute, whistle, mandolin and tenor banjo that bridges the cultures of Scotland, Ireland and Appalachia. 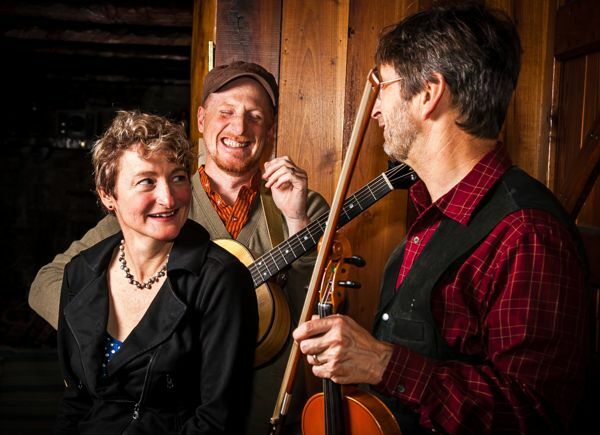 Band members Alice Fleischman, Michael Broderick and Andrew Nelson are multi-instrumentalists who have played throughout the Mid-Atlantic states, at the Kennedy Center and in Europe. Their music has twice been featured on NPR’s Thistle & Shamrock music program. All three have played in numerous musical groups spanning styles as diverse as Classical, Appalachian, Celtic & Alternative. Aurora Celtic will begin performing at 5 p.m.
A cross between B.B. King, Ray Charles, and Jimi Hendrix, the Dennis McClung Blues Band offers a unique blend of originals and blues classics. They have been performing since 1989, and in 2006, were honored by the Governor of West Virginia who recognized Dennis McClung as Ambassador of the Blues for the State of West Virginia by the Blues Hall of Fame. They will be the last musical act of the evening, beginning at 6:30 p.m. In addition to the music lineup, Rhythm and Wine will also feature two West Virginia wineries—Forks of Cheat Winery from Morgantown, and Vu Ja De Vineyards from Spencer. Local craft vendors will be set up outside of the Beverly Heritage Center, with items including jewelry, woodworking, antiques, soaps, and pottery. There will be food vendors selling barbecue for lunch, and bread and cheese plates as a lighter option to complement the wine tasting. Rhythm and Wine is sponsored by the Randolph County Convention and Visitors Bureau and The Inter-Mountain. This program is presented with financial assistance from the WV Division of Culture and History, and the National Endowment for the Arts, with approval from the WV Commission on the Arts.